Syringe filters are necessary for the fast and efficient handling and filtering of liquids in labs and research facilities. We offer disposable syringe filters in 13mm, 25mm, and 33mm sizes. All our filters are composed of membranes reinforced with polypropylene houses. They give a reliable seal without requiring adhesives. We offer a choice between sterile and non-sterile filters for pre-filtration, clarification, and fine particulate removal. ASI Syringe Filters filters are used press liquid through a filter using a plastic housing with a membrane. Due to the design, these polyethersulfone (PES) membranes are certified for use with filtration of nucleic acids and proteins. They are also used in tissue culture and protein filtration, and in ion chromatography. ASI syringe filters are a good choice for sample preparations of aqueous or partially organic media with a pH from 2 to 12. They are available in sterile packages that are individually wrapped or in non-sterile cases. Non-sterile filters can be sterilized in by autoclave at 125°C for 15 minutes. 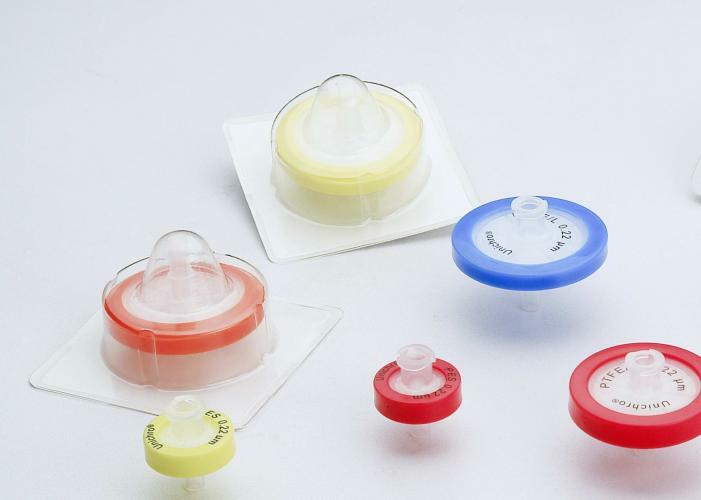 EZFlow Sterile Syringe Filter that are Hydrophilic PVDF are used in sample preparation for clarification and particle extraction prior to analyzing. They are suitable for methods such as HPLC, IC, and GD and available in a pore size of 0.2µm or 0.45µm. Membranes are reinforced with polypropylene housing comprised of a female Luer-lok inlet and a male Luer slip outlet. Polyethersulfone (PES) – Hydrophilic EZFlow Sterile Syringe Filters are also available. Choose from 0.22µm or 0.45µm PES in 13mm, 25mm, or 33mm sizes. 0.2µm membranes are suitable for developing a sterile solution that does not contain free-living bacteria. They can also be used for general sterilizing and clarifying biological solutions. 0.45µm membranes will remove most, but not all bacteria. The 0.45 µm is also ideal for prefiltration of solutions. Both sizes remove yeast, fungi, and fungal spores. EZFlow Syringe Filters are available in 13mm and 25mm sizes with 0.2µm or 0.45µm pore size. Made with a filter membrane of PES or Hydrophilic PVDF materials and a glass fiber pre-filter, they are also reinforced with polypropylene housing with a female Leur-lok inlet and a male slip outlet. Glass Fiber Syringe Filters are another product used in various lab and research applications. The filter material is glass fiber. This EZFlow product is available in 13mm, 25mm, and 33mm sizes with 0.2µm or 0.45µm pore sizes. As with other EZFlow Syringe Filters, they are reinforced with polypropylene housing with a female Leur-lok inlet and a male slip outlet. For high throughput filtration of viscous and particle-laden solutions, EZFlow Syringe Filters with Glass Fiber Prefilters are often the syringe filter of choice. They are available in either PES or Hydrophilic PVDF materials and are reinforced with polypropylene housing and a female Leur-Lok inlet with a male Leur Slip outlet. The 25mm size is offered in both 0.2µm and 0.45µm pore size. When working with difficult-to-filter samples, these 2-in-1 filters offer superior filtration without the need for two steps. They also offer cost savings when compared to purchasing each filter component separately. Whether you are supplying requirements for a lab or research facility, we understand the need to have the right filters available. Our aim is to provide quality items, prompt shipping, and excellent customer service. Click here (*add link) to begin your order. If you have any questions, please feel free to contact us.